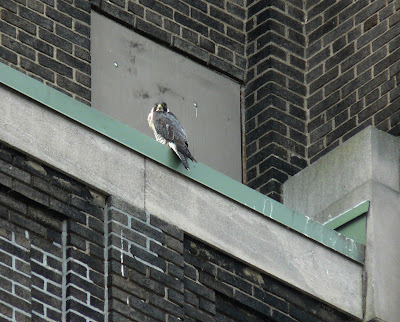 We haven't seen Stash or Stella lately at Central Terminal so they have likely migrated away for the coming winter season. The terminal is a very cold and windy place even in better weather than a Buffalo winter. The birds bonded this year but since the female was a sub-adult, there was no actual nesting. We expect them to return in late winter of 2010 and get down to business! These pix are from earlier this year.